Your toddler has started to sing along to the ABCs. He adorably stumbles through the L-M-N-O-P part, but he’s forgiven, because so do you. He can count to 14 without skipping too many numbers and only repeating 8 three times. All this must mean that he should start preschool, right? But how do you prepare him academically, socially, AND emotionally? Skip the flash cards, put away all the crafts and books (just for a few minutes) and crank up your stereo! 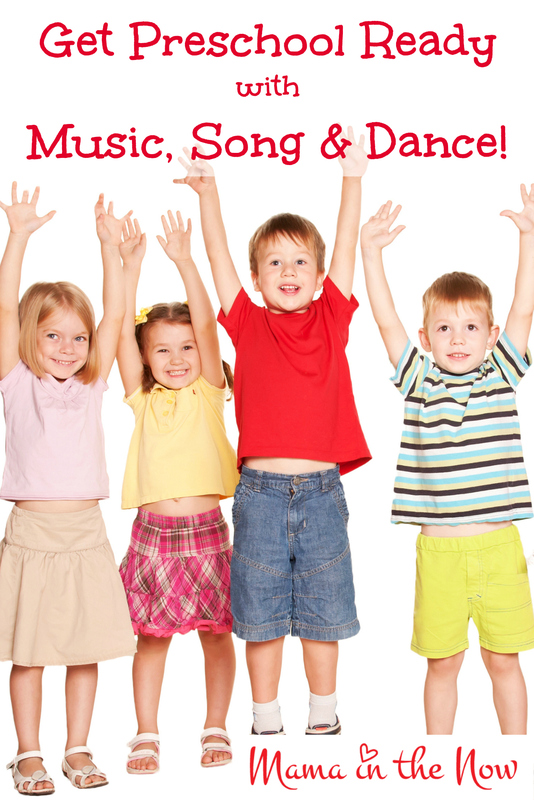 Let your child sing and dance his way to preschool! My favorite way to get the kids preschool ready is with music, song and dance! As a mom of four boys, I love how differently each of our children learn and process information. Jansen’s (3) learning language is clearly music. Recently I had the stereo cranked UP as I was driving around with the kids in the car. In true mom-fashion, the tunes I had blaring were of course children’s songs – because I am THAT cool! I was rocking out to Patty Shukla’s “Roar Like a Lion” when out of the corner of my eye I caught little hands flailing. Jansen had memorized the lyrics and was “getting into it” like only a three-year old strapped in a car seat can do. I was so happy and proud. Our little man absorbed every word and continued to sing Ms. Patty’s songs throughout the day. This is a great resource for preschool activities teaching colors and shapes, lots of fun activities. You can buy CDs and DVDs with your favorite songs in Patty Shukla’s Store on Amazon . We keep her CDs in both of our cars – always! “Roar Like a Lion“: Jansen LOVES mimicking the different animals. He REALLY gets into it! “Consonants”: Jansen mimics Ms. Patty’s song style in this song and it is hysterical. We have so much fun with this. “12 Months of the Year”: Be prepared to answer the question “which month is it now?” probably 27 times a day after you sing this song! Consider yourself warned. “Counting Song”: You will go through your day counting like Ms. Patty does in this song. It is a so catchy and fun! Don’t forget to check out Patty Shukla’s calendar, and find out when she’s performing near you. Click to view Patty’s website. This is NOT a sponsored post. We simply love music and are thrilled to have this fun and talented musician practically in our own backyard. Check out her YouTube videos and make sure to subscribe to her channel, I am sure you will enjoy her music too! Follow Ms. Patty on Facebook to see her adorable pictures from her shows and get information on all her new releases! Shop Patty Shukla’s Store on Amazon to get your own copy of her CDs and DVDs! Music is so important for preschoolers! I love how when my eldest entered preschool, he already knew most of the songs. We borrowed several CDs from the library and listened to them over and over. I am doing preschool with my son, so this all looks great! I imagine that remembering numbers and months are so much more fun and easier when it’s to a song. We do Kindermusik at work. But I really like one! Thanks for sharing! My son really likes it! This is a great way to keep kids active ! Thanks for all these resources! My 2.5 year old son looooves music and dancing! This is so great! I am always on the lookout for new fun, but educational songs I can get my 2 1/2 year old into. I totally agree with your point, too. What kid doesn’t love music and why not make learning fun, especially when they’re that young?! My twins are two and we already have music and dance time every day. My husband and I are musicians so it’s a big part of our lives. The boys can already pick up rhythms and it makes me insanely proud. Awesome! I’m going to have to play these for my 3 year old, he’ll love them!! Music education is so important for all children. With education budget cuts, it’s getting to the point where formal music lessons are becoming something only for the elite. Oh these are too fun!! I can’t wait to show my son when he wakes up!! He has really been cathing on to educational music and videos lately!! This will be a nice change from our usual! Even my little baby loves music and songs! I’m excited to watch her grow and interact with it more and differently <3. Our preschooler takes music classes from Lynn Kleiner’s Music Rhapsody. We LOVE IT! Everything is a game, yet he can keep a steady beat and completely match pitch. Music really does have an impact on learning! I love hearing that – I hope you are able to keep music in his life!